Lucy is by Anziyan a full brother to the great thoroughbred Sire Danehill who carries the Northern Dancer blood line. Her Dam Sky of Diamonds was by Sky Chase and there we see the Star Way line which has been recently proven an excellent eventing/jumping line, at the Beijing Olympics with a horse by Star Way on the winning German eventing team. On her Dam side we see Buzz my Bell, sister to Walhalla Girl, the half sister to Excelo, Dam of the Melbourne Cup horse Xcellent! What a winning pedigree she boasts. She passes to her progeny good bone, conformation and superb bodies and serious movement. Their temperaments are unflappable and they take to new situations and learning with a confidence way beyond their years. 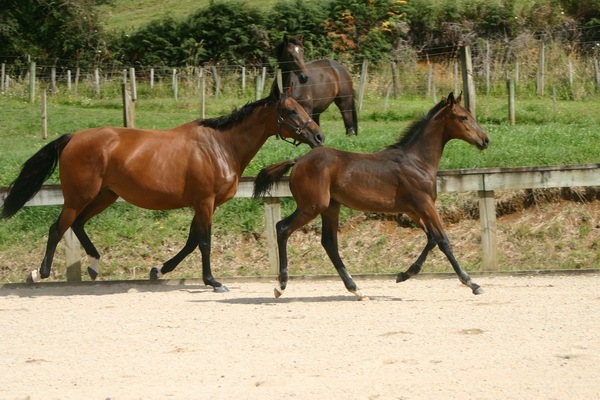 Lucy is an easy breeder, a good mother and prolific Colt producer. She always holds her condition well throughout the year and foals easily. Lucy was selected with eventing in mind with conformation and jumping ability as well as temperament. She has “Allander Harry” by Laudallander as a 2 yo, a real winner, and was so good that we did it again with Laudallander and yearling “Denis AA” could be even better. Pictures are of Lucy and Denis at Classification Febuary 2010.